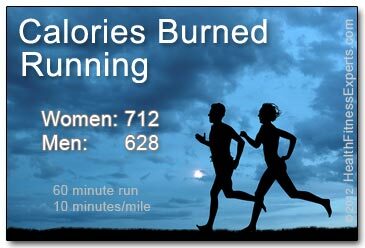 How many calories do you burn running? It depends on your weight, speed AND gender. Men burn more calories than women! Of course, the intensity of your running workout and the calories you’ll burn vary greatly based on the speed that you run. They also vary based on your gender, height, weight, and age. In general, women will burn more calories than men. You’ll also burn more calories if you are taller or older. And the more you weigh, the more calories you’ll burn. Take a look at the charts below to see how many calories you’ll burn running at various speeds. Note that there are two charts: one shows running calories burned for women and the other shows running calories for men. The calories in the tables are calculated using an average age of 35 and an average height of 5 feet 9 inches (176 cm) for men and 5 feet 4 inches (162 cm) for women. If you are older or taller, you’ll burn slightly more calories. If you are younger or shorter, you’ll burn slightly fewer calories. Calories shown are for a 60 minute workout. * Based on MET values from the “2011 Compendium of Physical Activities”, adjusted using the Harris Benedict equation for estimated RMR. Treadmill Running Tip: Use a 1% Incline! If you run on a treadmill, it’s important that you use the incline. If you want the same quality workout (and calorie burn) of running outside, you should set the treadmill incline to at least 1% incline to compensate for the lack of air resistance. Otherwise it will be like running downhill and you won’t burn as many calories. But note that this only matters if you running around 6.5 mph (9 minutes/mile) or faster. At slower speeds, it doesn’t matter. Many people find running to be difficult and tedious when they first start. But most people who stick with it end up getting addicted. It’s a great feeling to complete a good run. And running is one of the very best ways to burn calories and get a lean, healthy body. Do you run to burn calories? Do you love it or hate it? Do have a favorite run that you would recommend? We’d love to hear about it. Share it by using the comments below. Chelsea School Research Centre. University of Brighton, UK. I have started running very recently. U am doing it to loose weight. In summer I run outdoors, but at this snowing weather I prefer the treadmill. Last 1 week I am running 2 times a day and 7 days a week. I try to go a distance of minimum 5km a day. I run at a speed of 8km/hour most of the time. Some times I reduce it to 6km/hr and some times I increase in to 8/10/12 km/hr. what i try to do is..make it a 5 km distance covered per day. Hope i can continue it. I am 5′ 2″ tall and i weight 137 lbs. Good for you Jui. That’s a great workout!! !